The best part of a sandwich? All the stuff inside! 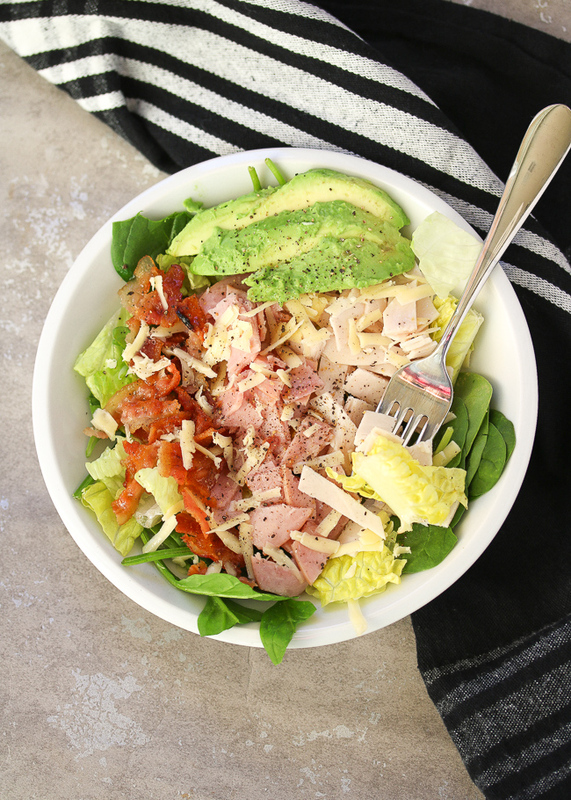 Turkey, bacon, avocado, veggies, your favorite condiments. The bread just holds it all together, am I right? Lettuce wraps are a great option when you're trying to reduce your carb load or avoid gluten/grains, but they can be tricky to hold together and are difficult to prep ahead. 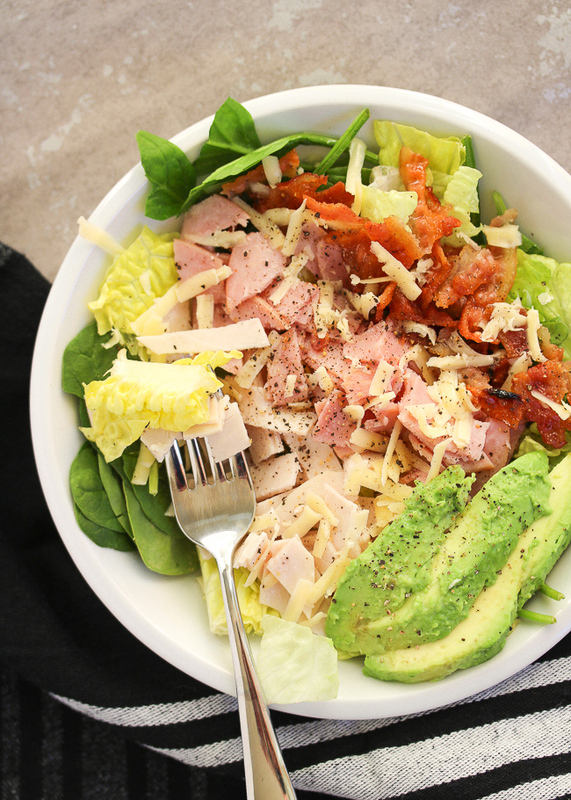 Enter the sandwich salad. All your favorite sandwich fixings, piled on a bed of greens. 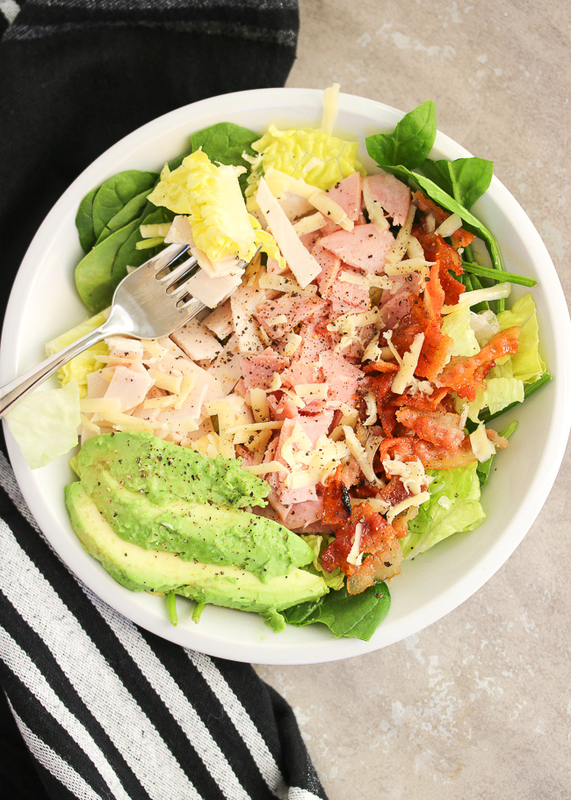 Top with your favorite condiments (a mustard vinaigrette would be great if you're a mustard person! ), a little salt & pepper, and you are good. to. go. 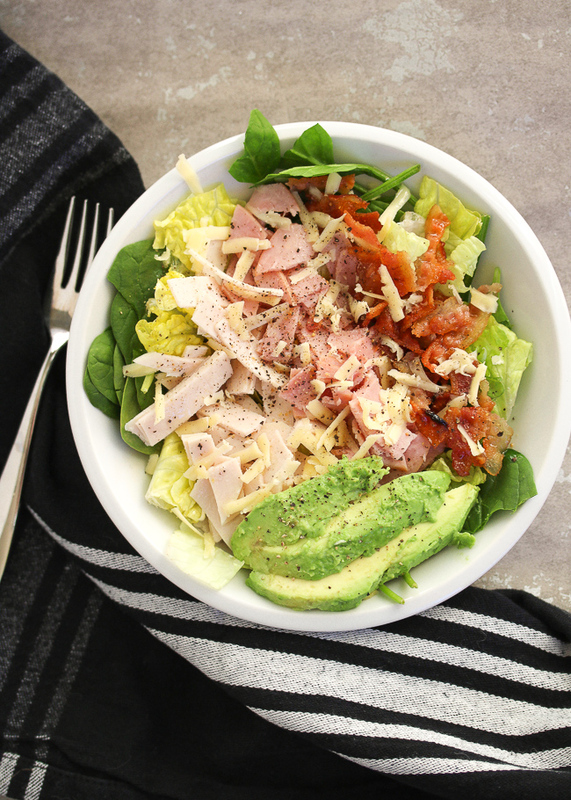 I've always been a turkey, bacon, & avocado kind of gal- so this is my favorite. I added some nitrite/nitrate free ham from TJ's that I love (not Whole30 but great any other time) and some grass-fed cheese for good measure. 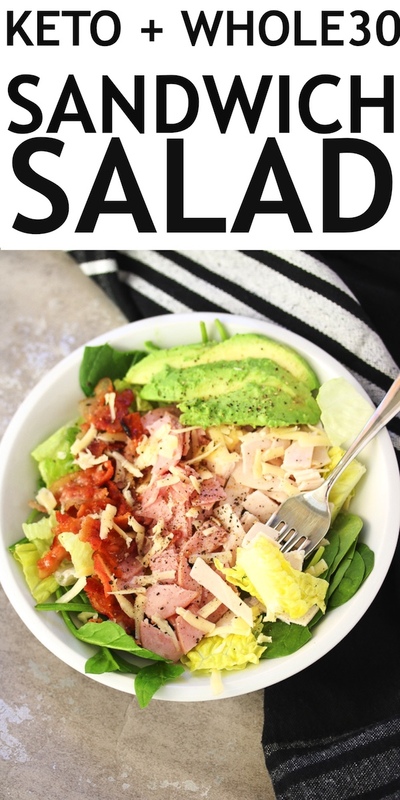 Salads are always sort of a no-brainer "no-recipe recipe" kind of meal for me, but when I asked if you'd like to see more salads on the blog over 96% of you said YES. So here we go- the start of more salads to come! Use this as a guide, like any recipe, and do it your way! Keep your favorite sandwich in mind as inspiration and go for it: grilled chicken with balsamic vinegar, tri tip with some Whole30 BBQ sauce, "BLT" with oil & vinegar- you name it. I went with the oil & vinegar theme for my dressing because it's simple & adds just a bit of flavor without overpowering anything (I'm not a big dressing person). But also, it gives some extra healthy fats and a touch of acidity to balance out the flavors. Toppings are a great way to get creative too: pepperoncinis, sliced olives, red onion, and tomatoes... to name a few! I was always the plain Jane sandwich girl, so if I'm missing any topping ideas- tell me in the comments! I'd love to see your creations if you give this a try! Tag me on Instagram @justjessieb! Slice the deli meat into strips then chop into bite sized pieces. Chop the cooked bacon. Shred the cheese (if using). Scoop the avocado out of the peel and slice. 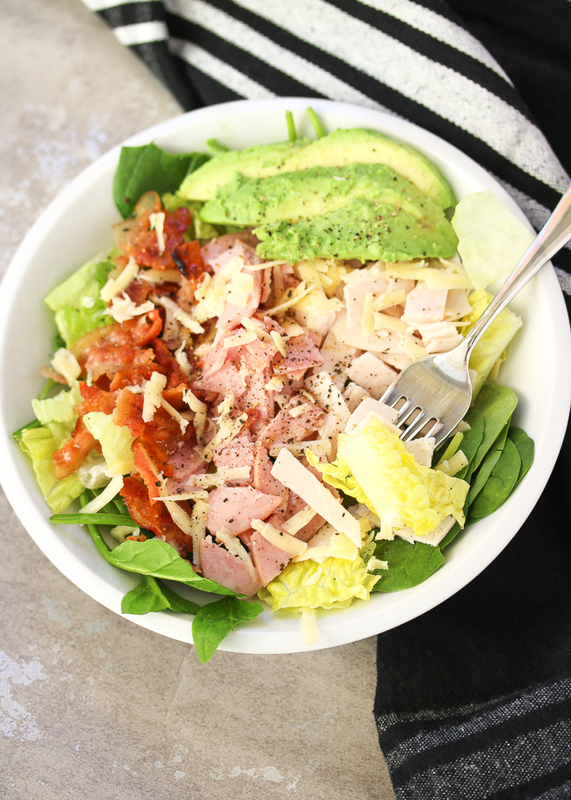 Arrange the greens in a salad bowl and top with meat, cheese (if using), and avocado. Drizzle with avocado oil and apple cider vinegar, and season with salt & pepper to taste. For deli meats, I like a mix of organic turkey & ham when not doing Whole30. It can be tricky to find compliant versions of ham, but for turkey check Trader Joe's or anywhere that carries Applegate and see if they have the compliant versions! Look out for nitrates/nitrites and sneaky sugars. For bacon, ButcherBox makes a great compliant bacon that I bake every week and keep on hand in the fridge. If you're not doing a Whole30, Trader Joe's has a great "fully cooked" option that we like!